This work was composed in 1803-1804, at the same time that Ludwig van Beethoven was composing Fidelio, which explains the many similar themes of the 1st movement with the opera. A premier performance, private, took place in the spring of 1804, in Vienna, in the salons of Prince Lobkowitz, at the same time as the “Eroica” Symphony. The work was truly presented in Vienna, in May 1808. It is a unique work in it's genre, in the sense that it constitutes a synthesis between the concerto grosso and the symphony concertante. It requires three experienced soloists, their parts are technically very difficult. Note the parts of the soloists are of equal importance and the balance between them was particularly researched by the composer. The concerto is rarely played, due to the fact of the difficulty of gathering together three prestigious soloists, a great orchestra and a good conductor. The orchestra comprises: 1 flute, 2 oboes, 2 clarinets, 2 bassoons, 2 horns, 2 trumpets, timpani and strings. Allegro, in C major, 4/4, comprises 531 measures and lasts for approximately 18 mins. It is in sonata form with two principal themes. Tutti orchestra begins, in an unusual fashion, pianissimo and a crescendo rapidly leading to a fortissimo: the principal theme, in a martial style, is announced. The 2nd theme intervenes, very singingly. The tutti lasts for approximately 2'30'' and suddenly leaves place for the soloists. The cello enters, followed by the violin which is then joined by the piano: it is the beginning of a true concertante part tracked successively or conjointly by the three soloists, accompanied by the orchestra. This constitutes a long exposition. The development properly said is short. After 11 minutes, the recapitulation arrives, followed by a coda. Note there is no cadenza in the first movement, and also not in the finale. Largo, in A flat, 3/8, comprises 53 bars and lasts for approximately 5 minutes. It is possible to find a relationship between the Concerto for piano and orchestra no. 3. A short orchestral introduction, then the cello plays molto cantabile a tender melody, a sort of elegy, very emotive, followed by piano scales leading to the tune on the violin, followed by a dialogue with the cello. A short conclusion leads, after a short transition, directly to the finale. Rondo alla polacca, in C major, 3 /4, comprises 475 bars and lasts for approximately 13 minutes. It combines Rondo and Sonata forms. The cello attacks the joyous theme of the refrain and and frequently imposes it's supremacy, but the violin and piano are not left out. The refrain is repeated three times as the three couplets are not easy to identify. But the entire sequence is logical, the three soloists always give evidence of great virtuosity. Note, after the third couplet, an allegro passage before a brilliant coda. Conclusion: this work is truly little known master piece. Even if the work is seldom played in concert, there exists about forty versions on disc: see the selection on the site. It is the version to which I listen with the greatest pleasure. My impression is that of a trio which best masters the interaction between the soloists. 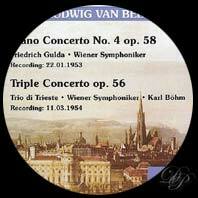 Then, the Trio di Trieste is one of the most famous of the time, and this performance is not surpassed. Finally, there is a “live” effect on the recording, which is irreplaceable.